REMINDER: Overnight Lane Closures and Detour on Sunset Hills Road Sunday, March 25 - Thursday, March 28, 10 p.m. to 5 a.m.
Sunday, March 25 - Thursday, March 28, 10 p.m. to 5 a.m.
On or about Sunday, March 25 through Thursday, March 28, from 10 p.m. to 5 a.m. each night, the eastbound lanes of Sunset Hills Road, near intersection of Town Center Parkway, will be closed. Westbound Sunset Hills Road will be reduced to one right thru lane and set-up to accommodate two-way traffic. Police will direct eastbound Sunset Hills Road traffic onto the right lane of westbound Sunset Hills Road. Traffic control devices will be in place to ensure safe separation of two-way traffic. The road will return to normal service no later than 5 a.m. each day. Police will be on site for safety and to monitor traffic flow. These nighttime closures will allow Dulles Corridor Metrorail Project construction crews to deliver large, heavy elements of the Traction Power Sub-station (TPSS) and place them on site using a crane that will be positioned on the south sidewalk. The TPSS will provide power to the future Reston Silver Line station. Beginning at 10 p.m. each night, EASTBOUND Sunset Hills Road traffic will be diverted to WESTBOUND Sunset Hills Road at the intersection of Town Center Parkway. Westbound Sunset Hills Road will be separated by traffic control devices (i.e. cones or drums) to safely facilitate two-way flow of traffic. Eastbound Sunset Hills Road will be closed east of the detour. A crane will be positioned on the south sidewalk and the sidewalk will be closed in this location. 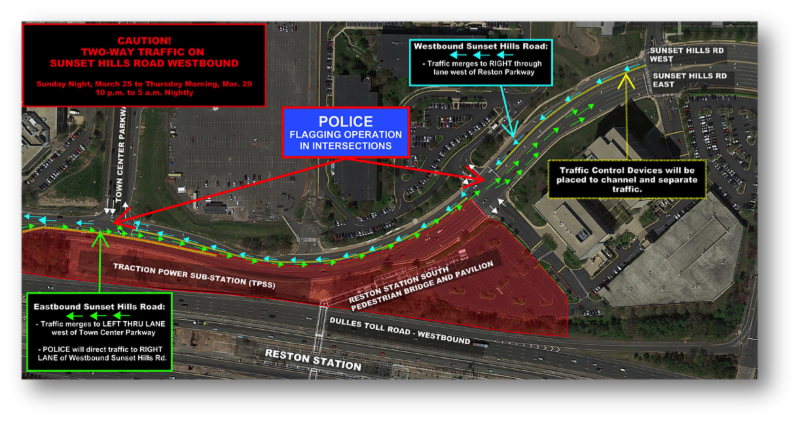 The detour will end just west of Reston Parkway.